Here at CPMFITness School of Fitness, we’re proud to provide free consultations to anyone interested in starting their fitness journey with us. Let’s face it – finding a program that speaks to you and your goals is hard, and sticking with one is even more difficult. How many times have you started something and not even a few weeks later life gets in the way and you never go back? Give us a call/text to schedule a phone interview… Yes a phone interview (what ‘gym’ does that?? We want to know more about you, your life, why you want to get fit and where we fit into the picture. We want to know what we can do to hold you accountable and how we can develop a plan of action to ensure you get fit for good this time! You’re probably thinking: “I’m not in shape enough for this yet and I don’t know anyone at CPMFITness and I’m really nervous to just walk in the door!” Don’t worry about a thing, because you’ll find that at CPMFITness we maintain a lighthearted and welcoming atmosphere that caters to regular people just like you! So much so that a ton of our members just hang around all day calling CPMFITness their second or even third home! Contact us to schedule a call, because just walking in the door is the biggest hurdle to your success! Lets face it, you’re destined to fail if you don’t have someone in your corner backing you up every step of the way. Big box gyms bank on you never using your membership, but we want to see you here each and every week making continued progress toward your personalized goals. If you fall off track expect a call from your coach asking where you’ve been and encouraging you to get back in the gym. 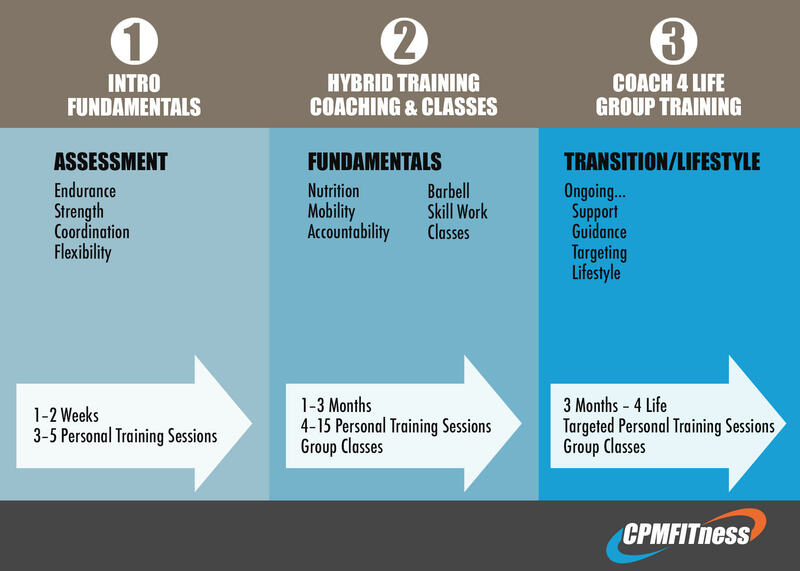 Simply starting and falling off track then never coming back just doesn’t happen at CPMFITness School of Fitness. We are 100% committed to your success and well being! The social environment, the community and the friends you make will give you a different sort of push, and will help you reach new heights of fitness. Each and every person at CPMFITness School of Fitness is dedicated to not only ensuring they succeed, but ensuring everyone else succeeds. There is no judgement at CPMFITness School of Fitness, only a community of like-minded individuals who come together to create an incredibly strong community!